Hitching a ride on the rocket that launches Nasa’s Exploration Mission-1, scheduled for June 2020, will be an unusual package: Saccharomyces cerevisiae, or brewer’s yeast. The package will be ejected to orbit around the sun as a six-unit CubeSat (a type of miniaturized satellite for space research). Each CubeSat unit of the mission, called BioSentinel, is about the size of a large shoebox with two units designated for navigation and communication. The remaining four—close to 300 wells with 100,000 dried yeast cells—will be stored in microfluidic cards and fed with nutrients. The microfluidics allow for finely tuned experiments in timing the addition of nutrients. Low-power LED detectors that record changes at specific wavelengths will be another enabler. The spacecraft, to be launched as the secondary payload of Exploration Mission-1, will be a “free-flyer", an autonomous craft. Powered by solar panels, a star tracker will orient the craft and allow it to communicate with Nasa’s Deep Space Network via antennae. The aim of the BioSentinel mission is to study cell damage from ionizing radiation beyond the Van Allen belt. This magnetic sphere, extending tens of thousands of kilometres in space, protects the earth. Living systems have not been studied beyond the Van Allen belt for 40 years, with most recent experiments confined to the low earth orbit (LEO)—the orbit of the International Space Station (ISS). Sharmila Bhattacharya, lead scientist and principal investigator of the BioSentinel mission at Nasa’s Ames Research Centre in California, says on the phone, “We have been able to miniaturize these spacecraft but they are pretty powerful." In missions ranging from six months to a year, such as those to Mars, there will be extended exposure to such radiation. “We want to see the effects of exposure to this deep-space radiation over long durations. How does the radiation affect the yeast cells and how do they cope with it?" says Bhattacharya. When such ionizing radiation hits a cell, it causes damage through DNA double-strand breaks. If the damaged cell is not repaired, it can lead to cancer or the cell can simply die. But there are several repair pathways available, the principal one being homologous recombination repair. 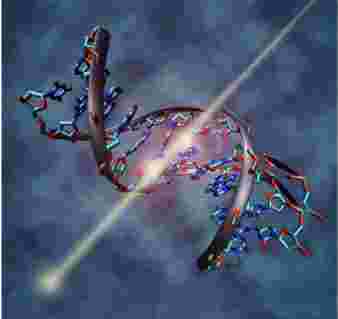 Genes encode for proteins that “do the job" for cells. These genes are conserved in yeast and humans, remaining largely the same over millions of years. The nucleus of yeast is also similar in structure to human cells, which has membranes. For comparison with the samples out in space, there will be a similar package of yeast cells on the ISS, minus the units for navigation. Another package will be on the ground, most likely at the Nasa Ames Research Centre. Scientists are already building a database of results with known radiation doses at the Brookhaven National Laboratory in New York. The aim is to know how “the cell damage signature is corresponding to what kind of radiation," says Bhattacharya. It can’t all be done at the Brookhaven laboratory, though. “The kind of radiation you get in deep space is difficult to mirror exactly on the ground," adds Bhattacharya. At the laboratory, samples get a one-time acute dose of radiation. In space, astronauts will be constantly bombarded by the particles, though the doses are expected to be low. Then, there is the effect of gravity. “You not only get to see what the radiation environment will do to your biological system (in space) but also whether the fact that there is less gravity has an effect on your system or not," explains Bhattacharya. The BioSentinel will carry three strains of yeast: a wild type which is robust, a modified strain, where the DNA repair gene is defective, and a biosensor strain. The modified strain is what scientists call a sensitized background. “We perturb the system, and make it more sensitive to this environmental toxin," says Bhattacharya, the “toxin" in this case being deep-space radiation. The third strain of yeast (which serves as a biosensor to radiation) will be compared to a physical sensor on board the BioSentinel. Essentially, the biosensor has a biological system, the readings from which will be used to measure, calculate and assess the radiation levels. The fact that Saccharomyces cerevisiae is called brewer’s yeast leads to the question whether one can make an alcoholic beverage like beer from it. Bhattacharya mentions that a colleague had indeed done so. “Yeast is yeast," she says. But these are the genetically modified strains, whose purpose is different than those modified for taste. “The beer probably wouldn’t taste as good as the beer you would go out and drink with your friends on a weekend," she quips. The brewer’s yeast will not be the only unexpected package the Exploration-1 mission will be carrying. Aboard the crew compartment of the Orion spacecraft will be two female mannequins set to orbit the moon, following the Matroshka-1 experiments on the International Space Station in 2004-05, named after the Russian nesting dolls. The Matroshka-1’s aim was to measure radiation doses not only on the surface of the skin but through the layers of the human body and organs. It led to papers like Astronaut’s Organ Doses Inferred From Measurements In A Human Phantom Outside The International Space Station. A photograph in the paper shows the male mannequin. It was tethered outside the station by astronauts, where it spent over 500 days. Astronauts have, of course, spent considerable time inside the ISS. Scott Kelly, an American astronaut, was in orbit for 11 months from March 2015 onwards. Scientists observed Scott’s identical twin, Mark, on earth while studying the effects of space on the human body. Data from Nasa’s so-called Twins Study are still coming in but there are preliminary findings. These coincide with what Bhattacharya mentions as the broad learning from the ISS. “The good news is that we know astronauts can be in space and come back," she says. There are, however, changes in the astronaut’s DNA, which may be signs of DNA damage. “The changes are subtle but measurable," she says. The yeast cells will now provide a living biological reference in an expanse where no human has gone before. “We want to understand what happens at the molecular and cellular level, and once we understand that, we know how to fix it," says Bhattacharya. The yeast data will provide pointers on what can be given to astronauts to prevent DNA cell damage. Bhattacharya, who grew up in Kolkata and studied at Loreto House before earning a PhD in molecular biology from Princeton and conducting post-doctoral research in neurobiology from Stanford, was inspired by her biology teacher in school. She remembers being intrigued during biology classes, especially Mendellian genetics. “There is a lot of information, there’s a lot of work that people have done over centuries," she says. Even in research with yeast, she mentions, there are centuries of scientific literature. What comes to mind is the work of Edward Buchner in 1897 for which he won the Nobel Prize in 1907 and newer experiments on yeast by Yoshinori Ohsumi, who won the Nobel in 2016. But Bhattacharya realizes that there remains a vast unknown. “It is such a fascinating balance between the education that is so essential for us and then being able to move beyond that training and sort of challenge your mind to really look beyond," she says. Come launch day, expected in 2020, there is the opportunity to reach for the unknown. “It is a mixture of relief, excitement, anticipation—because you want the experiment to go well. But it is a feeling that’s bigger than yourself," says Bhattacharya. She says that the day-to-day minutiae and what it takes to get it up there is her primary preoccupation till it launches. “Your blood, sweat and tears are on it... and then you are satisfied with it, you package it and send it so far away," says Bhattacharya. “It is going to go farther than anything you have ever touched before."